While I do love the new updates to the gMax +, I don't have 9 grand to pay for 3 new printers. 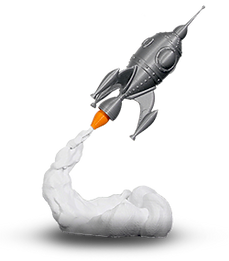 So I do appreciate Gordon's willingness to keep things under creative commons and available to the public for their own tinkering. These are a trifecta of printers I'm building using the 1.0 and 1.5 STL files. I don't have it all figured out yet. Specifically the extruders. But so far so good. They will sit nicely next to my gMax 1.0 and gMax 1.25 DW. Those look great. That double wide is awesome I remember seeing it a while ago. $9K is a tough pill to swallow. We were sold the printers under the creative common license and it being open source. We were encouraged to extend and modify the printers. Under that pretext we own the right to keep it in the public domain (1.5 and previous) so it's strange the files were pulled from the DL section of the site. You said you were still figuring out the extruders. May I suggest the E3D Volcanos? For your large format prints, they will greatly lessen your print times and they produce great results. Looking forward to seeing them finished! Are you willing to share you BOM? My 1.0 has a glass bed with a sheet of aluminum (from Home Depot) underneath for mounting the glass. I use washers to hold the glass in place. Set up the Auto Bed Leveling, and it's working pretty good. Worth doing. If want pics or firmware LMK. Hey, thanks. Well I'm not really doing large format prints. I was, but they didn't work out so well. And I need to create thin vents, so I'm probably going to keep with E3D v6 all metal. I tried the lite, but there was a ton of oozing. The way the extruder system worked, I didn't know if I should switch to the 1.5 or the 1.5+ design. I wish I could do that 5 axis setup you posted! I'd share my BOM if I had one. But I'm just sorta tinkering in the basement. I buy parts as I go along, modify STL files as needed, and use whatever I already have in the house from old projects that never got finished. If I knew how to do the auto bed leveling, I'd add it in! I had some misumi extrusion left over from the $150 free last year, so I added those as a place to put the acrylic bed. It will be 10"x20" since it works for what I'm building. When I need something different, I find STL files free online, and mod them how to fit my uses. Like where to put the Ramps 1.4 and attach a cooling fan. If it's too big, it won't make as fine of a product. That's why I'm keeping the size now to 10"x20". It's all I need to make my products (a work in progress). All that said, I'll try and working on a BOM once these are finished and tested. But since I'm mainly using stuff because it's lying around the house, I'm not sure it's really useful to anyone. These are amazing, I have not seen updates in a couple weeks about the progress. As I am a novice to this 3D printing, can you detail how to MOD a 1.5+ to have the AutoLeveling? Please? Anyone? I would pay handsomely for plans, and even better, a kit, if someone could make it available. Sorry. 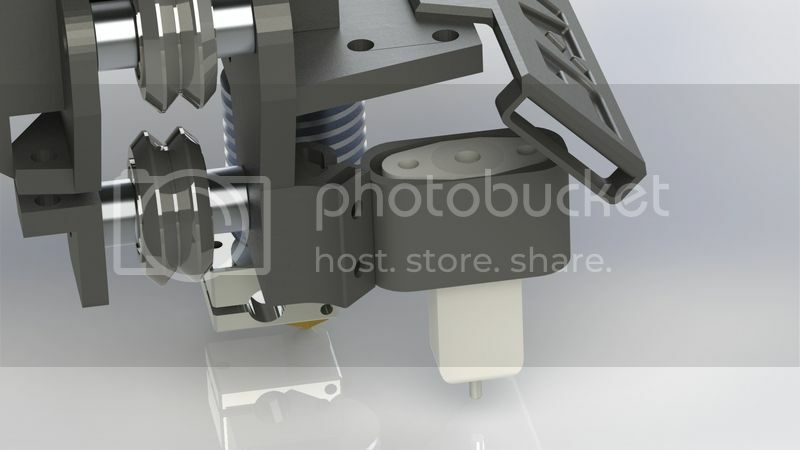 I'm stuck on how the fan mounts to the back of the extruder for the 1.5. Does any have a photo of this? I'll grab one when i get in mate. No worries. Got it fixed. I wonder if a 10mm fan might work rather than a 15mm fan. Anyway I had to do a ton of adjustment to get it working for my needs. Most of my prints are over 18" wide, but just 1" thick, so this prints 21" wide by 7" thick. Not sure about height, but I figure a 15" print height is nice when you need it. Here is one I got up and running today. I way prefer the motors at the bottom. 1 down, 2 to go. Augh. I'd give you guys a BOM, but I really end up using whatever spare parts are around the house, so I can even tell you how many m3 screws in what lengths. In the future I'd love to do a wider spacing, but I get the 1515 80/20 off ebay, and buying in 12" and 24" widths is cheap. Tried to watch the vid but it says its private! Woops. Sorry. It should have been unlisted. Fixed it. Anyway ran into a weird issue. Everything works fine until the extruder heats and bed tries to go to the center position. Not sure why, but the motor for the Y axis goes the wrong way. Any idea? I watched the vid thanks! How fast are you printing there?? - Y Axis Homing Direction, mine now works that when it is homed it is actually -420mm. 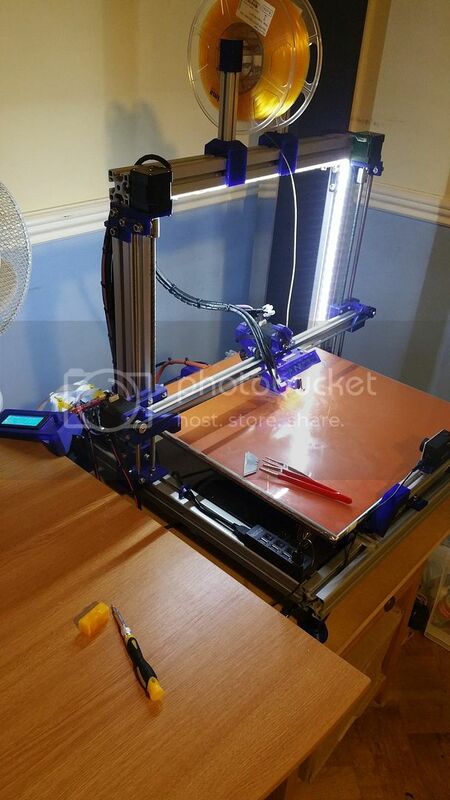 I think this is the same for the stock gMax too, its because the bed homes towards the front of the printer frame, this isn't conventional and usually a printer would home to the rear, meaning that the front left of the bed was Home. So if you wanted you could also make the printer home to the rear, its just a pain when the print finishes and you have to jog the bed to the front to remove your print. Other than that the printer looks great! Hope that helps, oh yeah i wanted to ask, could you upload or point me in the direction of you RAMPS mount?? I want to mount mine the same, currently its in a big ugly box. Looks like the Y_MAX_POS was causing the issue. It needs to be at least 220. Any idea why or how to change it? Other than that, everything is calibrated and ready to go. I attached the file. I think. I hope it helps! Hiya mate, sorry for the late reply, im not quite surewhat you mean when you say it needs to be a minimum of 220?? The file works great thank you! It finally gave me an exscuse to semi tidy the wiring and move the ramps box off of my desk. Theres a few pics of how it sits now. I like your heated bed solution. I would like to learn more about it. I have the early version of the gMax 1.0 that I have upgraded to the new gMax 1.5 plus bed as well as printed a few side support parts to stiffen up the frame, because the early version 1.0 was very flimsy. I have it now where I can print 60 microns with no problems. I have upgraded to the Gmax 1.5 plus firmware, but had to make changes in the code to make it work. I also calibrated with a micrometer the x, y, and the z axis to make sure that were all perpendicular to each other as before my prints were were coming out with strange dimensions. Any way, I'm happy now, but I started to print parts to upgrade the printer frame to the 1.5 +,but I want to get the head auto level, and a heated bed on this new build. The new code of the gMax 1.5 + has provisions for auto-bed-level, so that is encouraging. How many watts is your silicone heated mat? Is is heavy? Are you running an external power supply with a relay? How many watts is the power supply, or are you running directly from the main outlet (220 or 110v). I would be interested to hear your approach. I have been debating on a PCB or silicone mat for some time. i know the PCB are lighter, but can bow when heated if they are made with bad quality material. - V-Slot H-Frame Using 8 V Wheels. - 6mm Bakelite / Phenolic Sheet. - 9mm Cork Sheet With Cutout for Heatbed Wiring. - Silicone HeaterPad Approx 2mm Thick. The bed is fairly heavy, but as long as it moves freely on the rails it hasn't been a problem. 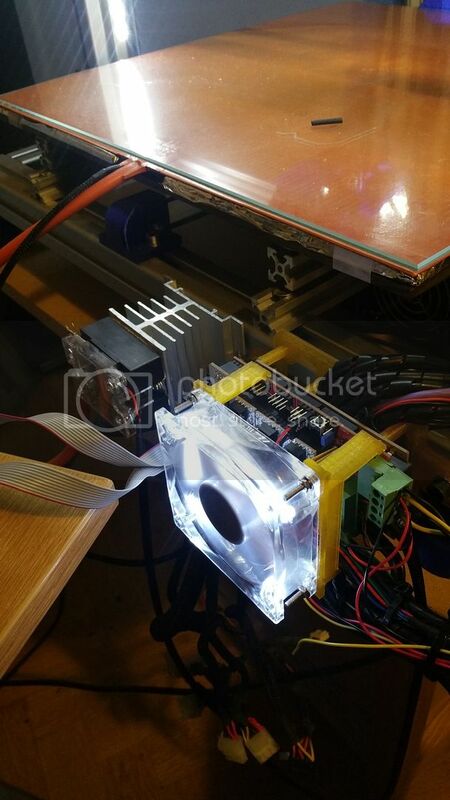 The Heated Bed is 240 Volt, 1500 Watt (http://www.aliexpress.com/item/Sili...adhesive-abd-100k-thermistor/32400676471.html) - It is powered directly from the mains AC, and is controlled using the RAMPS via a DC / AC Solid State Relay. The heater is obviously quite powerful, but it heats up very quick and doesn't produce heat in the wrong places (Wiring, SSR etc) like you get when trying to power a bed this size through 12 or 24 Volts as they require a lot more Amps. It will heat to 80c in about 15 seconds, and can heat to 130+. 1500 Watt sounds juicy, but in reality it takes 15 - 20 seconds to heat, then is run Bang-Bang mode, meaning that it only switches on for a couple of seconds at a time to maintain temperature. There are things to consider, in the earlier revisions of my heated bed, the plastic parts on the bed would warp from the heat and eventually become unusable, I solved this by using the Bakelite Sheet and 9mm Cork Sheet at the bottom, this insulates the Bed Carriage from the bulk of the heat, I bought some Reflect-A-Gold tape to take this further but so far have not had the need to. An amount of heat still transfers to the Bed Carriage but not enough to warp parts, my printer parts are also printed in PETG now so are not as easily deformed by heat. I'm not sure what the 1.5+ bed uses in terms of plastic parts. 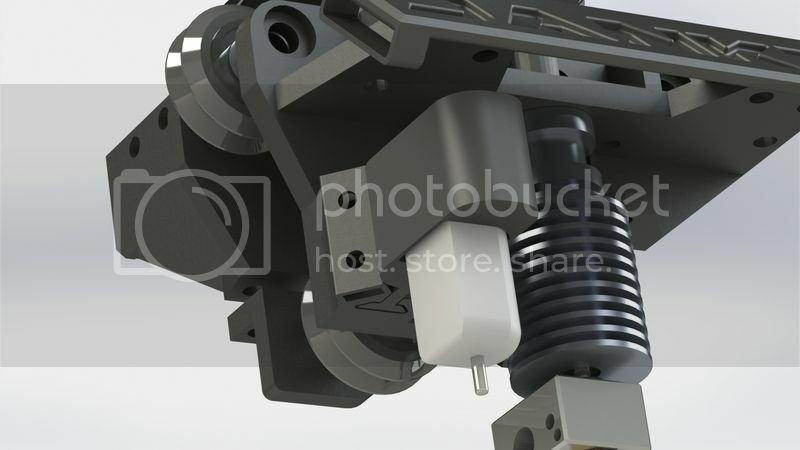 Parts like the Fan Shroud and other Extruder parts will feel the heat if left performing bottom layers for long periods of time, they will sag and eventually get pulled off when they clash with the print. Heat resistant materials should be used to re-print the extruder. I'm not sure which version of Marlin the 1.5+ firmware is using, but i would recommend that you use the latest RC3 Release of Marlin, this has a more refined version of the Auto Bed Level code that shows good improvements from before - the 1.5+ firmware may already be using RC2 or RC3 Marlin. 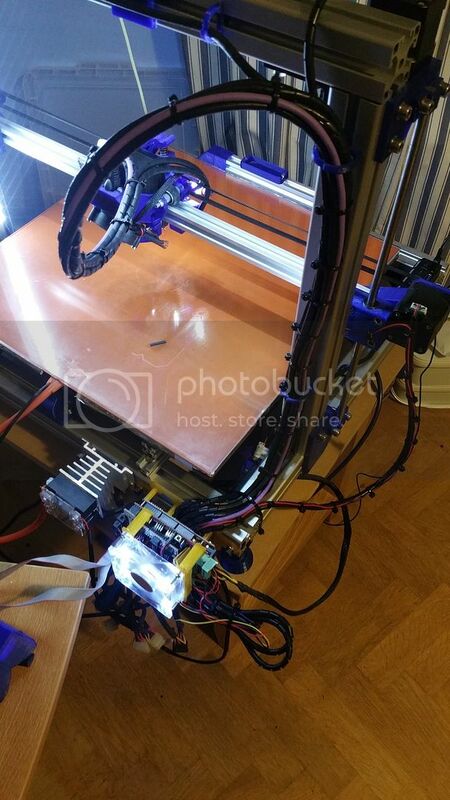 Thank you for taking the time to post in detail your approach on how you integrated your heat bed. I like it. As mentioned I have now the 1.0, and in a slow process of upgrading to a 1.5 + version. I am printing parts slowly. I recently went though a reprint, rebuild and reinforcement process of my 1.0. I went from not being able to print straight lines, and not hold dimensions to almost perfect prints. A lot of work, trouble shooting, and modifications. I can understand why one would want to go from the 1.0 to the 1.5+. I figure I need to post somewhere in this forum some of mods and calibrating changes I did on my 1.0 as I'm sure there are other owners out there of the 1.0 that could be running into the same issues as I did. Any way, I am still trading right now if I want to do silicone heated mat or a kapton heater (as they are lighter / less inertia). So I will be upgrading to a heated bed soon. So far I can even print PETG up to a certain size parts,.After that well you know, the warping ... So, I am nt in a rush, but I realize that it needs to be done. Any way, as I figure out what path I want to take I'll make sure to post my thoughts out here. I'm interested to see how the kapton heater works out for you. The only bit of solid advice I can give you is to make sure you have a solid 'base bed' and cork insulation. Good stuff! I tried a heat bed. But it honestly takes forever to heat up. I can understand that. This is why I decided to go for an AC powered heater.